BBC NEWS | Business | Hope, talk and... action? 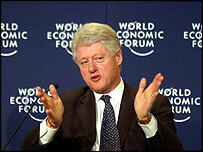 With the World Economic Forum now over for another year, Mike Rake looks back on 2004's event. Has anyone, I wonder, ever undertaken a detailed study of the output from the annual general meeting of the World Economic Forum in Davos? Millions of words are spoken, sentiments expressed and contacts made. But what is the consequence of more than 2,000 of the World's political, economic, business and cultural leaders being concentrated in one place? From an outsider's perspective, the expectations must be great, and they certainly expect results. But what are an insider's thoughts? Well, as the great and the good depart from Davos, it is time for me to take stock of the numerous events that were packed into a very tight schedule in the last few days. There is much to think about; much to consider. Why do I go? Well, the main reason why I come to such an event as Davos is to judge the mood of the key players, who will have an impact on every global citizen's life. And what have I discovered? Well, I have found that the essence of this year's meeting was not about 'what you have learned', but 'what you have understood'. Looking at the top line - on the upside, I think that there is a growing level of optimism moving forward for the next few years, particularly at a geopolitical level. Let's hope that this feeling turn into action. On the downside, I have some concerns on the political front, greatest among these is that there may still be a transatlantic mismatch of the philosophy of the US and the EU - the United States now feels that Europe understands the need for unilateral military action, whilst the EU believes that the US could not afford another war and has learned its lesson. As I prepare to enjoy a small amount of down time by going down hill - on the ski slopes, of course, that set this venue apart from most others - I will depart Davos with hopes for the next 12 months and beyond. I hope to see an end to the accounting and corporate governance scandals which has blighted my profession over the last two year; I have high hopes on the further convergence on accounting and regulatory standards; and, I hope, a wider understanding and respect for the role of the auditor. Looking at the wider economic and political picture, I remain optimistic about there being genuine progress in the Middle East, and I hope there will be a return to employment growth in both the US and the EU. What did I get out of Davos on a personal level? Internally a great deal of punishment was inflicted on my liver during the informal meeting in the bar in the evening. However, many old relationships were renewed and new ones established. This internal punishment will no doubt be more than matched externally as I go out on the piste for a couple of hours. I hope you have enjoyed my thoughts and views from the World Economic Forum. As a conclusion, I would like to leave you with one hope - we have done the talking, now let's see the action!